The present paper describes policies and guidelines for scholarly publishing of biodiversity and biodiversity-related data, elaborated and updated during the Framework Program 7 EU BON project, on the basis of an earlier version published on Pensoft's website in 2011. The document discusses some general concepts, including a definition of datasets, incentives to publish data and licenses for data publishing. Further, it defines and compares several routes for data publishing, namely as (1) supplementary files to research articles, which may be made available directly by the publisher, or (2) published in a specialized open data repository with a link to it from the research article, or (3) as a data paper, i.e., a specific, stand-alone publication describing a particular dataset or a collection of datasets, or (4) integrated narrative and data publishing through online import/download of data into/from manuscripts, as provided by the Biodiversity Data Journal. The present guidelines are based on an earlier version published in PDF on Pensoft's website in 2011 ( Penev et al. 2011 ). However, the process of implementation of data publishing practices in Pensoft's journals started earlier ( Penev et al. 2009a, Penev et al. 2009b ). Since that time, several novel approaches in both biodiversity and general research data publishing have been developed, mostly due to large-scale international efforts through networks such as FORCE11 (Future of Research Communication and e-Scholarship), CODATA (The Committee on Data for Science and Technology), RDA (Research Data Aliance) and others. Persistence: Unique identifiers — and metadata describing the data and its disposition — should persist, even beyond the lifespan of the data they describe. Specificity and Verifiability: Data citations should facilitate identification of, access to, and verification of the specific data or datum that support a claim. Citations or citation metadata should include information about provenance and permanence sufficient to facilitate verfiying that the specific timeslice, version and/or granular portion of data retrieved subsequently is the same as was originally cited. One RDA output, the Scholix Inititive, under the RDA/WDS (ICSU World Data System) Publishing Data Services Work Group is of particular relevance, as it seeks to develop an interoperability framework for exchanging information about the links between scholarly literature and data, i.e., what data underpins literature and what literature references data. Within RDA, a Biodiversity Data Integration Interest Group has been established, which aims to "increase the effectiveness of biodiversity e-Infrastructures by promoting the adoption of common tools and services establishing data interoperability within the biodiversity domain, enabling the convergence on shared terminology and routines for assembling and integrating biodiversity data." With regard to biodiversity, some recently published papers emphasise the importance of publishing of biodiversity data ( Smith 2009 , Costello 2009 , Costello et al. 2013 , Smith et al. 2013, Hardisty et al. 2013 ). The urgent need for open, comprehensive, discoverable, interoperable, and reliable biodiversity data was further reinforced by the Aichi Biodiversity Targets of the United Nations' Strategic Plan for Biodiversity which have set an ambitious plan to stop biodiversity loss by 2020 ( Convention on Biological Diversity 2011 ). The key prerequisite for progressing, monitoring and achieving the Aichi targets is the implementation of policies, strategies and actions. These should be based on new approaches, methods and infrastructure for the collection, aggregation, curation, publication and dissemination of data. On the way to it, scientists and policy makers have to overcome several barriers and fill in many gaps in both our knowledge of biodiversity and associated ecosystem services and in the means we obtain, handle, process, and publish data ( Wetzel et al. 2015 ). The EU BON project funded by the European Union's Framework Program Seven (FP7) (Building the European Biodiversity Observation Network, grant agreement ENV30845) was launched to contribute towards the achievement of these challenging tasks within a much wider global initiative, the Group on Earth Observations Biodiversity Observation Network (GEO BON), which itself is a part of the Group of Earth Observation System of Systems (GEOSS). A key feature of EU BON is the delivery of near-real-time data, both from on-ground observation and remote sensing, to the various stakeholders to enable greater interoperability of different data layers and systems, and provide access to improved analytical tools and services; furthermore, EU BON is supporting biodiversity science-policy interfaces, facilitate political decisions for sound environmental management ( Hoffmann et al. 2014, Wetzel et al. 2015 ). A sound basis for pursuing these goals is the GEOSS 10-year Implementation Plan adopted in 2005, which has outlined a set of Data Sharing Principles (DSPs) (see also Uhlir et al. 2009 ). The present paper outlines the strategies and guidelines needed to support the scholarly publishing and dissemination of biodiversity data, that is publishing through the academic journal networks. A dataset is understood here as a digital collection of logically connected facts (observations, descriptions or measurements), typically structured in tabular form as a set of records, with each record comprising a set of fields, and recorded in one or more computer data files that together comprise a data package. Certain types of research datasets, e.g., a video recording of animal behaviour, will not be in tabular form, although analyses of such recordings may be. Within the domain of biodiversity, a dataset can be any discrete collection of data underlying a paper – e.g., a list of all species occurrences published in the paper, data tables from which a graph or map is produced, digital images or videos that are the basis for conclusions, an appendix with morphological measurements, or ecological observations. More generally, with the development of XML-based publishing technologies, the research and publishing communities are coming to a much wider definition of data, proposed in the BioMed Central (BMC) position statement on open data: "the raw, non-copyrightable facts provided in an article or its associated additional files, which are potentially available for harvesting and re-use" ( BioMed Central 2010 ). As these examples illustrate, while the term "dataset" is convenient and widely used, its definition is vague. Data repositories such as Dryad, wishing for precision, do not use the term "dataset". Instead, they describe data packages to which metadata and unique identifiers are assigned. Each data package comprises one or more related data files, these being data-containing digital files in defined formats, to which unique identifiers and metadata are also assigned. Nevertheless, the term "dataset" is used below, except where a more specific distinction is required. For practical reasons, we propose a clear distinction between static data that represent specific completed compilations of data upon which the analyses and conclusions of a given scientific paper may be based, and curated data that belong to a large data collection (usually called a "database") with ongoing goals and curation, for example the various bioinformatics databases that curate ever growing amounts of nucleotide sequences ( Cochrane et al. 2015 ). Both forms are of strong potential scientific interest and application. Where a static dataset is inextricably linked to a scientific paper, the data publisher must assure consistent and secure access to it on the same time scale as the text content of the digital article. As a consequence, it is not permissible to upload a new version of such data in ways that would replace the original, unless strict versioning is undertaken and the reader of the published article has easy access to the original version of the data resource as well as to updated versions. Curated data, on the other hand, are usually hosted on external servers or in data hosting centres. A primary goal of the data publishing process in this case is to guarantee that these data are properly described, up to date, available to others under appropriate licensing schemes, peer-reviewed, interoperable, and where appropriate linked from a research article or a data paper at the time of publication. Especially in cases where the long-term viability of the curated project may be insecure (e.g. in the case of grant funded projects) ( Chandras et al. 2009 ), the publisher may in addition support the publication of a dated and versioned copy of such data (with the option to update these with another version later on, keeping access to all versions). There is a widespread conviction that data produced using public funds should be regarded as a common good, and should be openly published and made available for inspection, interpretation and re-use by third parties. Open data increases transparency and the overall quality of research; published datasets can be re-analyzed and verified by others. Published data can be cited and re-used in the future, either alone or in association with other data. Open data can be integrated with other datasets across both space and time. Data integration increases recognition and opportunities for collaboration. Open data increases the potential for interdisciplinary research, and for re-use in new contexts not envisaged by the data creator. Needless duplication of data-collecting efforts and associated costs will be reduced. Published data can be indexed and made discoverable, browsable and searchable through internet services (e.g. Web search engines) or more specific infrastructures (e.g., GBIF for biodiversity data). Collection managers can trace usage and citations of digitized data from their collections. Data creators, and their institutions and funding agencies, can be credited for their work of data creation and publication through the conventional channels of scholarly citation; priority and authorship is achieved in the same way as with a publication of a research paper. Datasets and their metadata, and any related data papers, may be inter-linked into research objects, to expedite and mutually extend their dissemination, to the benefit of the authors, other scientists in their fields, and society at large. Published data may be structured as "Linked Data", by which term is meant data accessible using RDF, the Resource Description Framework, one of the fundamentals of the semantic web. Since RDF descriptions are based on publicly available ontology terms, ideally derived from a limited number of complementary ontologies, this permits automated data integration, since data elements from different sources have built-in syntactic and semantic alignment. Supplementary files underpinning a research paper and available from the journal's website. Data hosted at external repositories but linked back from the research article it underpins. Stand-alone description of the data resource in the form of scholarly publication (e.g., Data Paper, or Data Note - see, for example, Newman and Corke 2009 , Chavan and Penev 2011 , and Candela et al. 2015 ). Data published within the article text and downloadable from there in the form of structured data tables or as a result of text mining. This "integrated data publishing" approach has been implemented by the Biodiversity Data Journal (BDJ), which was developed in the course of the EU funded project ViBRANT ( Smith et al. 2013 ). Other examples of a similar approach are executable code published in an article ( Veres and Adolfsson 2011 ), or linking of a standard article to an integrated external platform that hosts all data associated with the article, and provides additional data analysis tools and computing resources (an example for that are GigaDB and the GigaScience journal - see Edmunds et al. 2016 ), or various kinds of implementing 3D visualisations on the basis of MicroCT files ( Stoev et al. 2013 ). Import of primary biodiversity data from Darwin Core compliant spreadsheets, or manually via a Darwin Core editor, into manuscripts and their consequent publication in a structured and downloadable format ( Smith et al. 2013 ). Direct online import of Darwin Core compliant primary biodiversity data from GBIF, Barcode of Life, iDigBio, and PlutoF into manuscripts through web services and their consequent publication in a structured and downloadable format ( Senderov et al. 2016 ). Import of multiple occurrence records of voucher specimens associated with a particular Barcode Index Number (BIN) ( Ratnasingham and Hebert 2013 ) from the Barcode of Life. Automated generation of data paper manuscripts from Ecological Metadata Language (EML) metadata files stored at GBIF Integrated Publishing Toolkit (GBIF IPT), DataONE, and the Long Term Ecological Research Network (LTER) ( Senderov et al. 2016 , see also Pensoft's blog for details). Automated export of the occurrence data published in BDJ into Darwin Core Archive (DwC-A) format ( Wieczorek et al. 2012 ) and its consequent ingestion by GBIF. The DwC-A is freely available for download from each article's webpage that contains occurrence data. Automated export of the taxonomic treatments published in BDJ into Darwin Core Archive. The DwC-A is freely available for download from each article that contains taxonomic treatments data. Novel article types in the ARPHA Writing Tool and its associated journals (Biodiversity Data Journal, Research Ideas and Outcomes (RIO Journal), and One Ecosystem): Monitoring Schema, IUCN Red List compliant Species Conservation Profile ( Cardoso et al. 2016 ), IUCN Global Invasive Species Database (GISD) compliant Alien Species Profile, Single-media Publication, Data Management Plan, Research Idea, Grant Proposal, and others. Nomenclatural acts modelled and developed in BDJ as different types of taxonomic treatments for plant taxonomy. Markup and display of biological collection codes against the Global Registry of Biological Repositories (GRBIO) vocabulary ( Schindel et al. 2016 ). Workflow integration with the GBIF Integrated Publishing Toolkit (IPT) for deposition, publication, and permanent linking between data and articles, of primary biodiversity data (species-by-occurrence records), checklists and their associated metadata ( Chavan and Penev 2011 ). Workflow integration with the Dryad Data Repository for deposition, publication, and permanent linking between data and articles, of datasets other than primary biodiversity data (e.g., ecological observations, environmental data, genome data and other data types) (see Pensoft blog for details). Automated archiving of all articles published in Pensoft's journals in the Biodiversity Literature Respository (BLR) of Zenodo on the day of publication. For any form of data publishing, follow the FAIR Data Publishing Principles ( Wilkinson et al. 2016 ). Follow the Joint Declaration of Data Citation Principles for citation of data in scholarly articles ( Altman et al. 2015 ). Deposition of data in an established international repository is always to be preferred to supplementary files published on a journal's website. Smaller data files, especially those directly underpinning an article, should also be deposited at a data repository and linked from the article. We recommended, however these to be published also as supplementary file(s) to the related article, to ensure an additional joint preservation and presentation of the article together with its associated data. Primary biodiversity data (species-by-occurrence) records should be deposited through the GBIF IPT. Sample-based biodiversity data (e.g., species abundances from monitoring or inventory studies) should be deposited through the GBIF IPT. Genomic data should be deposited at any of the three INSDC repositories (GenBank, European, Nucleotide Archive, ENA and the DNA Databank of Japan, DDBI) either directly or via an affiliated repository, e.g. Barcode of Life Data Systems (BOLD). Barcoding and metabarcoding data should be deposited at the Barcode of Life Data Systems (BOLD) or PlutoF. Protein sequence data should be deposited at UniProtKB. X-ray microtomography (micro-CT) scans should be deposited at Morphosource. Phylogenetic data should be deposited at TreeBASE. Heterogeneous datasets, or data packages containing various data types should be deposited in generalist repositories, for example Dryad Data Repository, Zenodo, Dataverse, or in another appropriate repository. Repositories not mentioned above or in the "Data Deposition in Open Repositories" section below, may be used at the discretion of the author, if they provide long-term preservation of various data types, persistent identifiers to datasets, discoverability, open access to the data, and well proven sustainablility record. Digital Object Identifiers (DOIs) or other persistent identifiers (e.g., "stable URIs") to the data deposited in repositories, as well as the name of the repository, should always be published in the paper using or describing that data resource. Exceptional cases when publication of data is not possible, or some of the data remain closed or obfuscated, should be discussed with the publisher in advance. In such cases, the authors should provide an open statement explaining why restrictions in open data publishing are needed to be put in force. The author's statement should be published together with the article. This section originates from a draft set of Data Citation Best Practice Guidelines that has been developed for publication by David Shotton, with assistance from colleagues at Dryad and elsewhere, and from earlier papers concerning data citation mechanisms ( Altman and King 2007 , Green 2009, Penev et al. 2009a ). It also encompasses the latest international efforts to standardise the data and software citation mechanisms carried out within the CODATA, FORCE11 and RDA networks ( CODATA/ITSCI 2013 , Starr et al. 2015 , Rauber et al. 2016 , Smith et al. 2016 ). The well-established norm for citing genetic data, for example, is that one simply cites the GenBank identifier (accession number) in the text. Similar usage is also commonplace for items in other bioinformatics databases. The latest developments in the implementation of the data citation principles, however, strongly recommend references to data to be included in the reference lists, similarly to literature references ( Rauber et al. 2016 ). The following guidelines apply to more heterogeneous research data published in other institutional or subject-specific data repositories frequently described in related journal articles or data papers (see below). They are intended to permit data citations to be treated as "first class" citation objects on a par with bibliographic citations, and to enable them to be more easily harvested from reference lists, so that those who have made the effort to publish their research data might more easily be ascribed academic credit for their work through the normal mechanisms of citation recognition. For such data in data repositories, each published data package and each published data file should always be associated with a persistent unique identifier. A Digital Object Identifier (DOI) issued by DataCite, or CrossRef, should be used wherever possible. If this is not possible, the identifier should be one issued by the data repository or database, and should be in the form of a persistent and resolvable URL. As an example, the use of DOIs in the Dryad Data Repository is explained on the Dryad wiki. Data citations may relate either to the author's own data, or to data created and published by others ("third-party data"). In the former case, the dataset may have been previously published, or may be published for the first time in association with the article that is now citing it. All these types of data should, for consistency, be cited in the same manner. An in-text citation statement containing an in-text reference pointer that directs the reader to a formal data reference in the paper's reference list. A formal data reference within the article's reference list. We recommend that the in-text citation statement also contains a separate citation of the research article in which the data were first described, if such an article exists, with its own in-text reference pointer to a formal article reference in the paper's reference list, unless the paper being authored is the one providing that first description of the data. If the in-text citation statement includes the DOI for the data (a strongly desirable practice), this DOI should always be presented as a dereferenceable URI, as shown below. Further to this, both DataCite and CrossRef recommend displaying DOIs within references as full URLs, which serve a similar function as a journal volume, issue and page number do for a printed article, and also give the combined advantages of linked access and the assurance of persistence ( Edmunds et al. 2012 , Ball and Duke 2015 ). For example, Dryad recommends to cite always both the article in association with which data were published and the data themselves ( Fig. 1 ). Recommendation of Dryad to cite both the original article in association with which the data were published and the data themselves. These components should be presented in whatever format and punctuation style the journal specifies for its references. The following example demonstrates in general terms what is required. Jones A, Bloggs B, Smith C (2008a). <Title of data package>. <Repository name>. doi: https://doi.org/#####. [Version and/or date of access]. Jones A, Saul D, Smith C (2008b). <Title of journal article>. <Journal> <Volume>: <Pages>. doi: https://doi.org/#####. Note that the authorship and the title of the data package may, for valid academic reasons, differ from those of the author's paper describing the data: indeed, to avoid confusion of what is being referenced, it is highly desirable that the titles of the data package and of the associated journal article are clearly different. The citation statement of data deposition should be included in the body of the paper, in a separate section named Data Resources, situated after the Material and Methods section. In addition, the formal data reference should be included in the paper's reference list, using the recommended journal's reference format. The following example demonstrates what is required. “The data underpinning the analysis reported in this paper were deposited in the Dryad Data Repository at https://doi.org/10.5061/dryad.t63mn ( Macías-Hernández et al. 2016 ). "The data underpinning the analysis reported in this paper were deposited in the Global Biodiversity Information Facility (GBIF) at http://ipt.pensoft.net/resource?r=montenegrina&v=1.5 (the URI should be used as identifier only in cases when DOI is not available) ( Feher and Szekeres 2016 ). Macías-Hernández N, de la Cruz López S, Roca-Cusachs M, Oromí P, Arnedo MA (2016) Data from: A geographical distribution database of the genus Dysdera in the Canary Islands (Araneae, Dysderidae). Dryad Digital Repository. https://doi.org/10.5061/dryad.t63mn [Version and/or date of access]. Feher Z, Szekeres M (2016): Geographic distibution of the rock-dwelling door-snail genus Montenegrina Boettger, 1877 (Mollusca, Gastropoda, Clausiliidae). v1.5. ZooKeys. Dataset/Occurrence deposited in the GBIF. doi: https://doi.org/10.15468/###### OR http://ipt.pensoft.net/resource?r=montenegrina&v=1.5, (the latter to be used in cases when DOI is not available). [Version and/or date of access]. A statement of usage of the previously published data, with citation of the data source(s) and of the related journal article(s), should be placed in a separate section named Data Resources, situated after the Material and Methods section. In addition, the formal data reference and a formal reference to the related journal article should be included in the paper's reference list, using the recommended journal's reference format. Macías-Hernández N, de la Cruz López S, Roca-Cusachs M, Oromí P, Arnedo MA (2016) A geographical distribution database of the genus Dysdera in the Canary Islands (Araneae, Dysderidae). ZooKeys 625: 11-23. https://doi.org/10.3897/zookeys.625.9847. A statement of usage of previously published data, with citation of the data source(s), should be placed in a separate section named Data Resources, situated after the Material and Methods section. In addition, the formal data reference should be included in the paper's reference list, using the recommended journal's reference format for data citation. The following real example demonstrates what is required. “The present paper used data deposited by the Zoological Institute of the Russian Academy of Sciences in the Global Biodiversity Information Facility (GBIF) at https://doi.org/10.15468/c3eork ( Volkovitsh et al. 2017 ). Volkobitsh M, Glikov A, Khalikov R (2017) Catalogue of the type specimens of Polycestinae (Coleoptera: Buprestidae) from research collections of the Zoological Institute, Russian Academy of Sciences. Zoological Institute, Russian Academy of Sciences, St. Petersburg, deposited in GBIF. https://doi.org/10.15468/C3EORK. [Version and/or date of access]. When publishing data, make an explicit and robust statement of your wishes regarding re-use. Use a recognized waiver or open publication license that is appropriate for data. If you want your data to be effectively used and added to by others, it should be fully "open" as defined by the Open Knowledge/Data Definition – in particular, non-commercial and other restrictive clauses should not be used. Explicit dedication of data underlying published science into the public domain via PDDL or CC-Zero is strongly recommended and ensures compliance with both the Science Commons Protocol for Implementing Open Access Data and the Open Knowledge/Data Definition. Requiring explicit statements that clearly place biodiversity data in the public domain, by applying a standardised waiver for any eventual copyright or database protection right, for example Creative Commons Zero (CC0). Some countries may still need special licenses for data irrespective of its source (cf. https://github.com/unitedstates/licensing/issues/31). To the maximum possible extent, rendering printed materials, PDFs, and other non-machine-actionable biodiversity data and narratives, into machine-readable and harvestable formats. In practice, a variety of waivers and licenses exist that are specifically designed for and appropriate for the treatment of data, as listed in Table 1 . Data publishing licenses recommended by Pensoft. The default data publishing license used by Pensoft is the Open Data Commons Attribution License (ODC-By), which is a license agreement intended to allow users to freely share, modify, and use the published data(base), provided that the data creators are attributed (cited or acknowledged). As an alternative, the other licenses or waivers, namely the Creative Commons CC0 waiver (also cited as “CC-Zero” or “CC-zero”) and the Open Data Commons Public Domain Dedication and Licence (PDDL), are also STRONGLY encouraged for use in Pensoft journals. According to the CC0 waiver, "the person who associated a work with this deed has dedicated the work to the public domain by waiving all of his or her rights to the work worldwide under copyright law, including all related and neighbouring rights, to the extent allowed by law. You can copy, modify, distribute and perform the work, even for commercial purposes, all without asking permission." Publication of data under a waiver such as CC0 avoids potential problems of "attribution stacking" when data from several (or possibly many) sources are aggregated, remixed or otherwise re-used, particularly if this re-use is undertaken automatically. In such cases, while there is no legal requirement to provide attribution to the data creators, the norms of academic citation best practice for fair use still apply, and those who re-use the data should reference the data source, as they would reference others' research articles. The Attribution-ShareAlike Open Data Commons Open Database License (OdbL) is NOT recommended for use in Pensoft's journals, because it is very difficult to comply with the share-alike requirement in scholarly publishing. Nonetheless, it may be used as an exception in particular cases. Many widely recognized open access licenses are intended for text-based publications to which copyright applies, and are not intended for, and are not appropriate for, data or collections of data which do not carry copyright. Creative Commons licenses apart from CC-Zero waiver (e.g., CC-BY, CC-BY-NC, CC-BY-NC-SA, CC-BY-SA, etc.) as well as GFDL, GPL, BSD and similar licenses widely used for open source software, are NOT appropriate for data, and their use for data associated with Pensoft journal articles is strongly discouraged. Authors should explicitly inform the publisher if they want to publish data associated with a Pensoft journal article under a license that is different from the Open Data Commons Attribution License (ODC-By), Creative Commons CC0, or Open Data Commons Public Domain Dedication and Licence (PDDL). Any set of data published by Pensoft, or associated with a journal article published by Pensoft, must always clearly state its licensing terms in both a human-readable and a machine-readable manner. Where data are published by a public data repository under a particular license, and subsequently associated with a Pensoft research article or data paper, Pensoft journals will accept that repository license as the default for the published datasets. Images, videos and similar "artistic works" are usually covered by copyright "automatically", unless specifically placed in the public domain by use of a public domain waiver such as CC0. Where copyright is retained by the creator, such multimedia entities can still be published under an open data attribution license, while their metadata can be published under a CC0 waiver. Databases can contain a wide variety of types of content (images, audiovisual material, and sounds, for example, as well as tabular data, which might all be in the same database), and each may have a different license, which must be separately specified in the content metadata. Databases may also automatically accrue their own rights, such as the European Union Database Right, although no equivalent database right exists in the USA. In addition, the contents of a database, or the database itself, can be covered by other rights not addressed here (such as private contracts, trademark over the name, or privacy rights / data protection rights over information in the contents). Thus, authors are advised to be aware of potential problems for data re-use from databases, and to clear other rights before engaging in activities not covered by the respective license. Open data repositories (public databases, data warehouses, data hosting centres) are subject- or institution-oriented infrastructures, usually based at large national or international institutions. These provide data storage and preservation according to widely accepted standards, and provide free access to their data holdings for anyone to use and re-use under the minimum requirement of attribution, or under an open data waiver such as the CC0 waiver. We do NOT include here and do NOT recommend for use repositories which provide data after permission or by other methods of human-controlled registration. Visibility: Making your data available online (and linking it to the publication) provides an independent way for others to discover your work. Citability: all data you deposit will receive a persistent, resolvable identifier that can be used in a citation, as well as listed on your CV. Workload reduction: if you receive individual requests for data, you can simply direct them to the files in Dryad. Preservation: your data files will be safely archived in perpetuity. Impact: other researchers have more opportunities to use and cite your work. There are several directories of data repositories relevant to biodiversity and ecological data, such as re3data, or those listed in the Open Access Directory, or in Table 2 of Thessen and Patterson (2011) . Extensive directories of institutional and other open access repositories are also provided by OpenDOOR, and the EU project OpenAIRE. A very useful resource that puts together information on journal data policies, repositories, and standards grouped by domain, type of data, and organisation is BioSharing ( Sansone et al. 2011, McQuilton et al. 2016 ). Such repositories could be used to host data associated with a published data paper, as explained below. For their own data, authors are advised to use an internationally recognised, trusted (normally ISO-certified), specialized repository (see Klump 2011 ). Examples of such repositories and databases are listed below, however repositories of primary importance for biodiversity data are described in finer detail below the list. The descriptions are compiled from various sources, most often from the webpages of the respective repositories and/or their BioSharing entries when available. PANGAEA. The information system PANGAEA operates as an open data repository aimed at archiving, publishing and distributing georeferenced data from earth system research. Each dataset can be identified and cited by using a DOI. Data are archived as supplements to publications or as citable data collections. Data citations are available through the portal of the German National Library of Science and Technology (GetInfo). Data management and archiving policies follow the recommendations of the Commission on Professional Self Regulation in Science, the ICSU Data Sharing Principles, and the OECD Principles and Guidelines for Access to Research Data from Public Funding. PANGAEA is open to any project or individual scientist to archive and publish data. Data submission can be started here. The Knowledge Network for Biocomplexity (KNB) is a USA-based national network intended to facilitate data management and preservation in ecological and environmental research. For scientists, the KNB is an efficient way to discover, access, interpret, integrate and analyze complex ecological data from a highly-distributed set of field stations, laboratories, research sites, and individual researchers. DataBasin is a free system that connects the users with spatial datasets, non-technical tools, and a network of scientists and practitioners. One can explore and download a vast library of datasets, upload and publish own data, create working groups, and produce customized maps that can be easily shared. DataONE provides the distributed framework, management, and robust technologies that enable long-term preservation of diverse multi-scale, multi-discipline, and multi-national observational data. DataONE initially emphasises observational data collected by biological (genome to ecosystem) and environmental (atmospheric, ecological, hydrological, and oceanographic) scientists, research networks, and environmental observatories. Dataverse is an open source web application to share, preserve, cite, explore, and analyze research data. A Dataverse repository is the software installation, which then hosts multiple dataverses. Each dataverse contains datasets, and each dataset contains descriptive metadata and data files (including documentation and code that accompany the data). As an organising method, dataverses may also contain other dataverses. Some dataverses may have non-CC0 data, for example the Singaporean NTU dataverse has CC-BY-NC licensed data by default. Protocols.io is an open access platform for publishing, sharing and finding life science research protocols. There are several aggregators and registries of taxonomic data, which differ in their content, policies and methods of data submisison. Catalogue of Life (CoL) is a comprehensive and authoritative global index of species and their associated taxonomic hierarchy. The Catalogue holds essential information on the names, relationships and distributions of over 1.6 million species, continuosly compiled from 158 contributing databases around the world (as of February 2017). The Catalogue of Life is led by Species 2000, working in partnership with the Integrated Taxonomic Information System (ITIS). Authors can submit their global taxon checklists to the CoL editors following a template and guidelines. Integrated Taxonomic Information System (ITIS) is established by several federal agencies of the USA to provide an authoritative taxonomic information on species of plants, animals, fungi, and microbes, and their hierarchical classification, with a focus on North America. Potential contributors to ITIS are encouraged to view the ITIS Submittal Guidelines. NCBI Taxonomy serves as a taxonomic backbone for the National Center for Biotechnology Infomation of the USA (NCBI), and its services, for example GenBank. NCBI Taxonomy is not a single taxonoimic treatise, but rather a compiler of taxonomic information from a variety of sources, including the published literature, web-based databases, and the advice of sequence submitters and outside taxonomy experts. International Plant Name Index (IPNI) is a collaborative effort between The Royal Botanic Gardens, Kew, the Harward University Herbaria, and the Australian National Herbarium to provide a single point of registration and reference for the names and associated basic bibliographical details of seed plants, ferns and lycophytes. The data are gathered and curated by a team of editors from the published literature and are freely available to the community. The pre-publication indexing of new plant taxa and nomenclatural acts in IPNI and inclusion of the IPNI identifiers in the original descriptions (protologues) was first trialled and made a routine practice in the journal PhytoKeys since the publication of its first issue in 2011 ( Kress and Penev 2011, Knapp et al. 2011 ). Later, Pensoft created an automated registration pipeline for new names in IPNI ( Penev et al. 2016 ). MycoBank is the leading online database, established by the International Mycological Association (IMA), for documenting new names and combinations of fungy, and associated data, for example descriptions and illustrations. The nomenclatural novelties are assigned a unique MycoBank identifier that can be cited in the publication where the nomenclatural novelty is introduced. These identifiers are also used by the nomenclatural database Index Fungorum. As a result of changes to the International Code for Nomenclature of algae, fungi, and plants, ICNafp) (previously International Code for Botanical Nomenclature, ICBN), pre-publication registration of names and inclusion of record identifiers in the published protologues is mandatory since January 1st 2013 (see Hawksworth 2011 ). Index Fungorum is a global fungal nomenclator currently coordinated and supported by The Royal Botanic Gardens, Kew. Index Fungorum contains names of fungi (including yeasts, lichens, chromistan fungal analogues, protozoan fungal analogues and fossil forms) at all ranks. Index Fungorum now provides a mechanism to register names of new taxa, new names, new combinations and new typifications following the changes to the ICNafp (see above). ZooBank is the Official Register of the International Commission on Zoological Nomenclature (ICZN) for registration of new nomenclatural acts, published works, and authors. Since 1st of January 2012, pre-publication registration in ZooBank has become mandatory for electronic-only publications ( International Commission on Zoological Nomenclature 2012 ). The Pensoft journal ZooKeys was the first to apply a mandatory registration of new zoological names at ZooBank since the publication of its first issue in 2008 ( Penev et al. 2008 ). Authors publishing nomenclatural novelties in Pensoft journals do not have to deal with registration of these at ZooBank because it is provided in-house, through an automated pipeline ( Penev et al. 2016 ). PaleoBiology Database is a public resource whose purpose is to provide global, collection-based occurrence and taxonomic data for marine and terrestrial animals and plants of any geological age, as well as web-based software for statistical analysis of the data. The project's wider, long-term goal is to encourage collaborative efforts to answer large-scale paleobiological questions by developing a useful database infrastructure and bringing together large data sets. There is an option to protect data for private use only. TreatmentBank is a resource that stores and provides access to taxonomic treatements and data therein, extracted from the literature. TreatmentBank is established by Plazi, who also provide a tool for text mining and data extraction called GoldenGATE Document Editor. Authors who publish in Pensoft's journals do not have to deal with deposition of their taxonomic treatments to Plazi, as the latter are harvested automatically using the TaxPub extension to the Journal Archival Tag Suite (JATS) ( Catapano 2010, Penev et al. 2012 ). The Global Biodiversity Information Facility (GBIF) was established in 2001 and is now the world's largest multilateral initiative for enabling free and open access to biodiversity data via the Internet. It comprises a network of 54 countries and 39 international organisations that contribute to its vision of "a world in which biodiversity information is freely and universally available for science, society, and a sustainable future". It seeks to fulfil this mission by promoting an international data infrastructure through which institutions can publish data according to common standards, thus enabling research that had not been possible before. The GBIF network facilitates access to over 704 million species occurrences in 30,894 datasets sourced from 867 data-publishing institutions (as of January 2017). GBIF is not a repository in the strict sense, but a distributed network of data publishers and local data hosting centres that publish data based on community-agreed standards for exchange/sharing of primary biodiversity data. At a global scale, discovery and access to data is facilitated through the GBIF data portal. Pensoft facilitates publishing of data and metadata to the GBIF network through Pensoft’s IPT Data Hosting Center, which is based on the GBIF Integrated Publishing Toolkit (IPT) ( Robertson et al. 2014 ). GBIF maintains a list of IPT installations, of which there are 174 as of January 2017, spread across 52 countries. A metadata file describing the entire dataset which GBIF recommends to be based on EML (Ecological Metadata Language 2.1.1). The format is defined in the Darwin Core Text Guidelines. Darwin Core is no longer restricted to occurrence data, and together with the more generic Dublin Core metadata standard (on which its ideas are based), it is used by GBIF and others to encode data about organism names, taxonomies, species information, and, more recently, sample data (i.e., data from ecological/environmental investigations that are typically quantitative and adhere to standardised protocols, so that changes and trends in populations can be detected). The Darwin Core Archive Spreadsheet Processor provides a set of MS Excel templates, which are coupled with a web service that processes completed files and returns a validated Darwin Core Archive. Templates exist for primary biodiversity data, simple checklists, and EML metadata. See http://tools.gbif.org/spreadsheet-processor/ for further details. The Darwin Core Archive Assistant is a browser-based tool that composes an XML metafile, the only XML component of a Darwin Core Archive. It displays a drop-down list of Darwin Core and extension terms, accessed dynamically from the GBIF registry, and displays these to the user who describes the data files. This allows Darwin Core Archives to be created for sharing without the need to install any software. See: http://tools.gbif.org/dwca-assistant/ for details. The Darwin Core Archive (DwC-A) files can be used to publish data underlying any taxonomic revision or checklist through the GBIF IPT or as supplementary files (see Baker et al. 2014 and a sample paper by Talamas et al. 2011 ). It can also be used to publish species occurrence data or sample data. The publication of large datasets in the form of data papers is also supported. Darwin Core Archive files can also be generated from data uploaded via the GBIF IPT and then published as a zipped supplementary file associated with a research article. As of version 2.2, the GBIF IPT incorporates use of DOIs allowing data publishers to automatically connect with either DataCite or EZID for DOI assignment. GBIF will issue DOIs for all newly published datasets where absent while recognizing and displaying publisher-assigned DOIs for existing datasets. The GBIF IPT now also requires publishers to select one of three standardised machine-readable data waivers or licenses (CC0, CC-BY, CC-BY-NC) for their data to clarify the conditions for re-use. Morphbank is a database of images and metadata used for international collaboration, research and education. Images deposited in Morphbank :: Biological Imaging document a wide variety of research including: specimen-based research in comparative anatomy, morphological phylogenetics, taxonomy and other biodiversity-related fields. Morphosource is a project-based data archive that allows researchers to store and organize, share, and distribute 3D data, for example raw microCt data and surface meshes representing vouchered specimens. File formats include tiff, dicom, stanford ply, and stl. Biodiversity Literature Repository (BLR) at Zenodo (see details in the section Biodiversity Literature below). TreeBASE is a repository of phylogenetic information, specifically user-submitted phylogenetic trees and the data used to generate them. TreeBASE accepts all types of phylogenetic data (e.g., trees of species, trees of populations, trees of genes) representing all biotic taxa. Data in TreeBASE are exposed to the public if they are used in a publication that is in press or published in a peer-reviewed scientific journal, book, conference proceedings, or thesis. Data used in publications that are in preparation or in review can be submitted to TreeBASE but are embargoed until after publication, and only available before publication to the publication editors or reviewers using a special access code. We also recommend following the best practices for sharing and publishing phylogenies, as detailed in Stoltzfus et al. (2012) and Cranston et al. (2014) . MorphoBank is an online database and workspace for images and affiliate data with those images (labels, species names, etc.) used in evolutionary research in systematics. MorphoBank provides a platform for live collaboration on phylоgenetic matrices by teams in a private workspace where they can interlink images with phylogenetic matrices. MorphoBank stores: phylogenetic matrices (Nexus or TNT format), 2D (including JPEG, GIF, PNG, TIFF and Photoshop) and 3D (PLY, STL, ZIP, TIFF and DCM) image data and video (MPEG-4, QuickTime and WindowsMedia). MorphoBank also offers a Documents folder for additional files related to the research, such as PDFs, Word documents, and text files (e.g., morphometric data, phylogenetic trees). International Nucleotide Sequence Database Collaboration (INSDC), mostly known through its founding partner, the NCBI GenBank. GenBank is a genetic sequence database, an annotated collection of all publicly available DNA sequences. Hosted at the National Center for Biotechnology Information (NCBI) at the National Library of Medicine (NLM) under the umbrella of the National Institutes of Health (NIH), GenBank is part of the International Nucleotide Sequence Database Collaboration (INSDC), which also comprises the DNA DataBank of Japan (DDBJ) and the European Bioinformatics Institute (EBI), which is part of the European Molecular Biology Laboratory (EMBL-EBI). Raw sequencing data in particular needs to be deposited in one of the INSDC data repositories, such as the NCBI Sequence Read Archive (SRA), the EBI European Nucleotide Archive (ENA), or the DDBJ Sequence Read Archive (DRA). These three organizations exchange data on a daily basis. They also handle assembled and annotated sequence data, as well as host a number of linked databases that handle more processed data types like variation data (with both the EBI and NCBI handling genetic and structural variants). An example of a GenBank record for a Saccharomyces cerevisiae gene may be viewed here. There are several options for submitting data to GenBank. The Barcode of Life Data System (BOLD) is established at the University of Guelph as "an informatics workbench aiding the acquisition, storage, analysis, and publication of DNA barcode (mostly COI) records" ( Ratnasingham and Hebert 2007 ). BOLD have an agreement with GenBank for deposition of barcode (COI) sequences in GenBank as well through a web-based Barcode Submission Tool. PlutoF Biodiversity Platform has been developed originally as a data management platform for barcode data based mostly on the Internal Transcribed Spacer (ITS) region as most suitable for the identification of fungi. Recently PlutoF was developed into a platform to "create, manage, share, analyse and publish biology-related databases and projects". PlutoF have an agreement with GenBank for deposition of gene sequences in GenBank. Always aim at depositing data before submission of the manuscript, so that they can be linked to and from the manuscript and are made freely available for peer-review. Even if not yet public during the review process, reviewer access is available via NCBI. Gene sequences should always be published in GenBank, either directly or through INSDC, even if they are openly available in other repositories. A paper dealing with gene sequences should always contain the GenBank accession numbers, and where possible should use the BioProject accession (formatted PRJxxxxx) as well. When including gene sequences deposited in other repositories, authors should provide hyperlinked identifiers (e.g. accession numbers) of those records in the manuscript text. It is strongly recommended to publish large genomic databases, or separate species genomes, or barcode reference libraries in the form of data papers or "BARCODE data release papers". A BARCODE data release paper is a short manuscript that announces and documents the public deposit to a member of the INSDC of a significant body of data records that meets the BARCODE data standards (for examples, see Rougerie et al. 2015, Schindel et al. 2011 ). The Protein Data Bank (PDB) created by the the Research Collaboratory for Structural Bioinformatics (RCSB) contains information about experimentally-determined structures of proteins, nucleic acids, and complex assemblies. As a memberof the Worldwide Protein Data Bank (wwPDB), the RCSB PDB curates and annotates PDB data according to agreed standards. See its data deposition policies and services. ArrayExpress (EMBL-EBI) and the NCBI Gene Expression Omnibus (NCBI GEO) are archives for data from high-throughput functional genomics experiments such as microarrays and sequencing based approaches such as RNA-seq, miRNA-seq, ChIP-seq, methyl-seq, etc. Data are collected to MIAME (Minimum Information About a Microarray Experiment) and MINSEQE (Minimum Information about a high-throughput SEQuencing Experiment) standards. Experiments are submitted directly to ArrayExpress or are imported from the NCBI GEO database and vice versa. ArrayExpress and NCBI GEO are strongly recommended for deposition of species genomes or transcriptomes, metagenomic and other biodiversity-related functional genomics data. For high-throughput sequencing based experiments the raw data is brokered to the EBI or GenBank, while the experiment descriptions and processed data are archived in these databases. EBI Metagenomics (EMBL-EBI) is a pipeline for the analysis and archiving of metagenomic data automatically archived in the European Nucleotide Archive (ENA) and intended for public release. GigaDB primarily serves as a repository to host data and tools associated with articles in the journal GigaScience; however, it also includes a subset of datasets that are not associated with GigaScience articles. GigaDB defines a dataset as a group of files (e.g., sequencing data, analyses, imaging files, software programs) that are related to and support an article or study. An example of multifunctional use of GigaDB or various types of biodiversity data is the paper of Stoev et al. (2013) and its associated editorial ( Edmunds et al. 2013 ). Metabolomics data should be deposited in any of the member databases of the Metabolomexchange data aggregation and notification consortium. Such partners, for example, are the EMBL-EBI MetaboLights repository and the Metabolomics Workbench of NIH, which are data archives for metabolomics experiments and derived information. Proteomics data should be deposited in any of the members of the ProteomeXchange consortium and following the MIAPE (The Minimum Information About a Proteomics Experiment) guidelines. The founding members of ProteomeXchange are Pride, the PRoteomics IDEntifications Database at the EMBL-EBI and PeptideAtlas, part of the Institute of Systems Biology in Seattle, USA. The other two repositories at ProteomeXchange are MassIVE and jPost. Pensoft encourages authors to deposit data underlying biological research articles in the Dryad Data Repository in cases where no suitable more specialized public data repository (e.g., GBIF for species-by-occurrence data and taxon checklists, or GenBank for genome data) exists. Dryad is particularly suitable for depositing data packages consisting of different types of data, for example datasets of species occurrences, environmental measurements, and others. Pensoft supports Dryad and its goal of enabling authors to publicly archive sufficient data to support the findings described in their journal articles. Dryad is a safe, sustainable location for data storage, and there are no restrictions on data format. Note that data deposited in Dryad are made available for re-use through the Creative Commons CC0 waiver, detailed above. Data deposition in Dryad is a subject to a small charge that the authors or their institutions should regulate directly with Dryad. Data can be deposited with Dryad either before or at the time of submission of the manuscript to the journal, or after the manuscript acceptance but before submission of the finally revised, ready-for-layout version for publication. Nonetheless, the authors should always aim at depositing data before submission of the manuscript, so that they can be linked both from and to the manuscript and made freely available for peer-review. The data deposition at Dryad is integrated with the workflow in Pensoft's ARPHA Journal Publishing System. The acceptance letters automatically generated by email by Pensoft's journals on the day of acceptance of a manuscript contain instructions on how to upload data underpinning the article to Dryad, if desired by the authors (see this blog post for details). Once you deposit your data package, it receives a unique and stable identifier, namely a DataCite DOI. Individual data files within this package are given their own DOIs, based on the package DOI, as do subsequent versions of these data files, as explained under DOI usage on the Dryad wiki. You should include appropriate Dryad DOIs in the final text of the manuscript, both in the in-text citation statement in the Data Resources section and in the formal data reference in your paper's reference list, as explained and exemplified above. This is very important, since if the data DOI does not appear in the final published article, that greatly weakens its connection to the underlying data. More information about depositing data in Dryad can be found at http://www.datadryad.org/repo/depositing. You may wish to take a look at some example data packages in Dryad to see how data packages related to published articles are displayed, such as doi: 10.5061/dryad.7994 and doi: 10.5061/dryad.8682. Data deposited in Dryad in association with Pensoft journal articles will be made public immediately upon publication of the article. Zenodo is a research data repository launched in 2013 by the EU-Funded OpenAIRE project and CERN to provide a place for researchers to deposit datasets of up to 50 GB in any subject area. Zenodo code is open source, and is built on the foundation of the Invenio digital library which is also open source. The work-in-progress, open issues, and roadmap are shared openly in GitHub, and contributions to any aspect are welcomed from anyone. All metadata is openly available under CC0 waiver, and all open content is openly accessible through open APIs. Zenodo assigns a DataCite DOI to each stored research object, or uses the original DOIs of the articles or research objects, if available. Scientists may use Zenodo to store any kind of data that can thereafter be linked to and cited in research articles. The repository allows non-open-access materials to be uploaded but not displayed in public, except for their metadata which are freely available under the CC0 waiver. Biodiversity Heritage Library (BHL) is a searchable archive of scanned public domian books and journals. Originally BHL was focusing mostly on the historical biodiversity literature, however now it is possible to incorporate also materials that are still under copyright through agreements with publishers. Pensoft journals harvest the BHL content for mentions of taxon names and display the original sources through the Pensoft Taxon Profile tool. Bibliographical metadata of the articles published in Pensoft's journals are submitted to BHL on the day of publication. On the top of the BHL content, Roderick Page from the University of Glasgow built BioStor as an open source application that searches and displays the BHL articles by article metadata and individual pages. The Biodiversity Literature Repository (BLR) is an open community repository at Zenodo built by Plazi and Pensoft to archive articles, images and data in the biodiversity domain. Plazi uploads article PDFs and other materials extracted from legacy literature through their GoldenGATE Imagine tool. Pensoft journals are automatically archiving in BLR all biodiversity-related articles, supplementary files and individual images, through Web services, on the day of publication. The uploaded materials are archived at Zenodo under their own DOIs, if exisiting, or are assigned Zenodo DOIs. The Bibliography of Life (BoL) was created by the EU FP7 project ViBRANT to search, retrieve and store bibliographic references and is currently maitained by Pensoft and Plazi. BoL consists of the search and discovery tool ReFindit and a repository for bibliographic references harvested from the literature, RefBank. Online publishing allows an author to provide data sets, tables, video files, or other information as supplementary information files associated with papers, or to deposit such files in one of the repositories described above, which can greatly increase the impact of the submission. For larger biodiversity datasets, authors should consider the alternative of submitting a separate data paper (see description below). Submission of data to a recognised data repository is encouraged as a superior and more sustainable method of data publication than submission as a supplementary information file with an article. Nevertheless, Pensoft will accept supplementary information files if authors wish to submit them with their articles and demonstrate that no suitable repository exists. Details for uploading such files are given in Step 4 of the Pensoft submission process (example from ZooKeys) available through the “Submit a Manuscript” button on any of the Pensoft journal websites. By default, the maximum file size for each supplementary information file that can be uploaded onto the Pensoft web site is 50 MB. If you need more than that, or wish to submit a file type not listed below, please contact Pensoft's editorial office before uploading. File format (including name and a URL of an appropriate viewer if the format is unusual). Title of the supplementary information file (the authorship will be assumed to be the same as for the paper itself, unless explicitly stated otherwise). Description of the data, software listings, protocols or other information contained within the supplementary information file. All supplementary information files should be referenced explicitly by file name within the body of the article, e.g. “See Supplementary File 1: Movie 1 for a recording of the original data used to perform this analysis”. 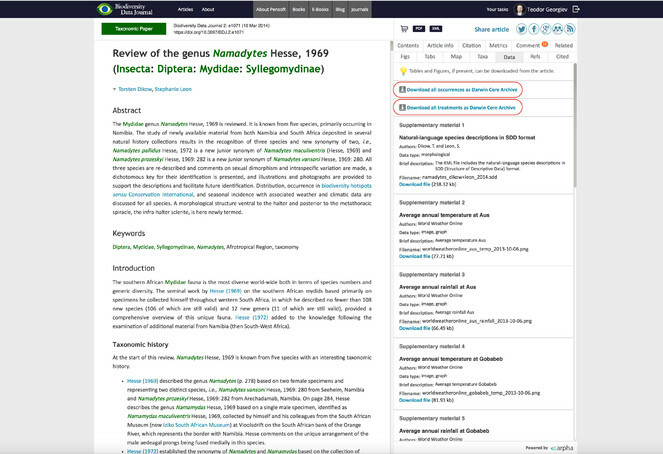 The ARPHA Writing Tool and the journals currently based on it (Biodiversity Data Journal, Research Ideas and Outcomes, One Ecosystem, and BioDiscovery) provide the functionality to cite the supplementary materials through in-text citations in the same way as figures, tables or references are cited. The file names should use the standard file extensions (as in “Supplementary-Figure-1.png”). Please also make sure that each supplementary information file contains one particular data type, or is of a single table, figure, image or video. To facilitate comparisons between different pieces of evidence, it is common to produce composite figures or to concatenate originally separate recordings into a single audio or video file. We do not recommend such practice, since it is often simpler to just open the two (or more) raw files in question and to appreciate and manipulate them side by side, and such concatenation is a barrier to re-use. Likewise, we do not recommend to provide metadata in non-editable ways (e.g., adding a letter or an arrow into bitmap images or video frames), which complicates re-use too (e.g. translation into another language, or zooming in for additional details). Open data formats should be preferred over proprietary ones (for example, for spreadsheets, CSV should always be preferred over XLS). Always follow community-accepted standards within the respective scientific domain (if such exist) when formatting data files, because this will make your data interoperable with other data in the same domain. To maximise interoperability, plain-text data files should be UTF-8 encoded with no embedded line breaks. For species-by-occurrence data, the authors are strongly encouraged to publish these through the GBIF Integrated Publishing Tookit (see above) first, then link to the data in the "Data resources" section of the article and also cite the dataset in the reference section via its GBIF DOI or the GBIF IPT unique HTTP identifier. In addition, authors may also publish the same data as supplementary files to the article in Darwin Core Archive. The Darwin Core Archive of the data can be downloaded from the GBIF IPT or created in another way. For species-by-occurrence data published as supplementary files to the article, authors should use a Darwin Core compliant spreadsheets or tabular text files (http://arpha.pensoft.net/lib/files/Species_occurrence-1_v1_DwC_Template.xls). automatically, through web services from online biodiversity data platforms (GBIF, Barcode of Life, iDigBio, and PlutoF). While the first two methods of data import speak for themselves and one could easily implement them following the instructions on the user interface, the third one deserves a more detailed description, as it is still unique in the data publishing landscape. Import of specimen records from GBIF, BOLD, iDigBio and PlutoF into ARPHA manuscripts. At one of the supported data portals (GBIF, Barcode of Life, iDigBio, and PlutoF), the author locates the specimen record he/she wants to import into the Materials section of a Taxon treatment (available in the Taxonomic Paper manuscript template in the Biodiversity Data Journal). Depending on the portal, the user finds either the occurrence identfier of the specimen, or a database record identifier of the specimen record, and copies that into the respective upload field of the ARPHA system ( Fig. 3 ). After the user clicks on "Add," a progress bar is displayed, while the specimens are being uploaded as material citations. The new material citations are rendered in both human- and machine-readable DwC format in the Materials section of the respective Taxon treatment and can be further edited in AWT, or downloaded from there as a CSV file. The user interface of the ARPHA Writing Tool through which single or multiple specimen records from GBIF, BOLD, iDigBio and PlutoF are imported through records identifiers. Occurrence records and taxonomic treatments (if present in the article), published in the Biodiversity Data Journal, are exported in two separate Darwin Core Archives (DwC-A) and are available for direct download or harvesting via web services. to bring the existence of the data to the attention of the scholarly community. The description should include several important elements (usually called metadata, or “description of data”) that document, for example, how the dataset was collected, which taxa it covers, the spatial and temporal ranges and regional coverage of the data records, provenance information concerning who collected and who owns the data, details of which software (including version information) was used to create the data, or could be used to view the data, and so on. Most Pensoft journals welcome submission and publication of data papers, that can be indexed and cited like any other research article, thus bringing registration of priority, a permanent publication record, recognition, and academic credit to the data creators. In other words, the data paper is a mechanism to acknowledge efforts in authoring ‘fit-for-use’ and enriched metadata describing a data resource. The general objective of data papers in biodiversity science is to describe all types of biodiversity data resources, including environmental data resources. An important feature of data papers is that they should always be linked to the published datasets they describe, and that link (a URL, ideally resolving a DOI) should be published within the paper itself. Conversely, the metadata describing the dataset held within data archives should include the bibliographic details of the data paper once that is published, including a resolvable DOI. Ideally, the metadata should be identical in the two places — the data paper and the data archive — although this may be difficult to achieve with some archive metadata templates, so that there may be two versions of the metadata. This is why referring to the the data paper DOI is so important. In principle, any valuable dataset hosted in a trusted data repository can be described in a data paper and published following these Guidelines. Each data paper consists of a set of elements (sections), some of which are mandatory and some not. An example of such a list of elements needed to describe primary biodiversity data is available in the section data papers Describing Primary Biodiversity Data below. 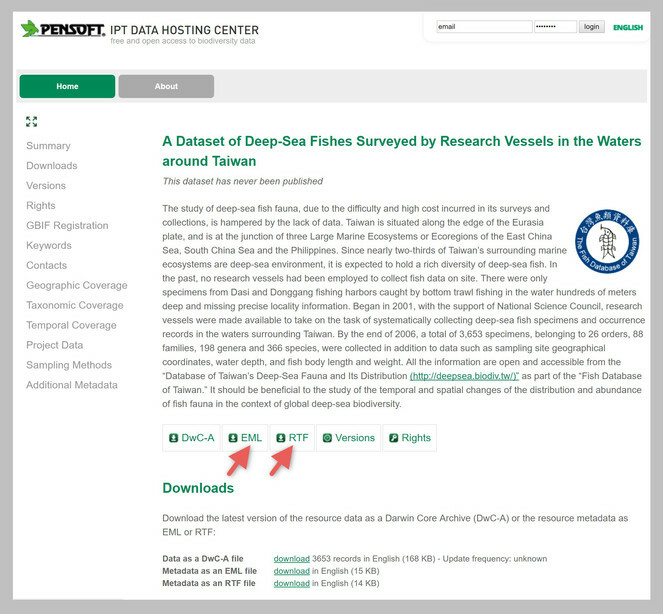 Sample data papers which can be used as illustration of the concept can be downloaded from several Pensoft journals, for example, ZooKeys (examples), or Biodiversity Data Journal (examples). All claims in a data paper should be substantiated by the associated data. If the methodology is standard, please explain in what respects your data are unique and merit a publication in the form of a data paper. Alternatively, if the methodology used to acquire the data differs significantly from established approaches, please consider submitting your data to an open repository and associating them with a standard or data paper, in which these methodologies can be more fully explained. At the time of submission of the data paper manuscript, the data described should be freely available online in a public repository under a suitable data license, so that they can be peer-reviewed, retrieved anonymously for re-use, resampling and redistribution by anyone for any purpose, subject to one condition at most — that of proper attribution using scholarly norms (see the Data Publishing Licenses and How to Cite Data sections, above). The repository, or at least one public mirror thereof, should not be under the control of the submitting authors. The relevant data package DOIs or accession numbers, as well as any special instructions for acquiring and re-publishing the data, should be included in the submitted data paper manuscript. The procedures for data retrieval should be described, along with the mechanisms for updating and correcting information. This can be achieved by referencing an existing description if that is up to date, citable in its exact version, and publicly accessible on the web. All methodological details necessary to replicate the original acquisition of the raw data have to be included in the data paper, along with a description of all data processing steps undertaken to transform the raw data into the form in which the data have been deposited in the repository and presented in the paper. Authors should discuss any relevant sources of error and how these have been addressed. In addition to data papers describing new data resources, data papers describing legacy data are also welcome, as long as the current version of these is publicly accessible and can be cited. If possible, authors should outline possible re-use cases, taking into account that future uses of the data might involve researchers from different backgrounds. We encourage the provision of tools to facilitate visualization and re-use of the data. For primary biodiversity (species-by-occurrence) data, authors are strongly encouraged to use the data publishing workflow of the GBIF Integrated Publishing Toolkit (IPT), described below. From IPT, data manuscripts can be generated in rich text format (RTF) directly from the metadata ( Fig. 5 ), provided that the respective dataset has already been indexed and properly described by metadata in the IPT (the process of data indexing through the IPT is described in the IPT Manual). The metadata from the GBIF Integrated Publishing Toolkit (IPT) can be downloaded as RTF or EML files and submitted to Pensoft's journals as data paper manuscripts. A more universal and innovative approach is conversion of the Ecological Metadata Language (EML) file available from IPT or other data platforms, such as DataONE or LTER, into data paper manuscripts in the ARPHA Writing Tool ( Fig. 6 ). 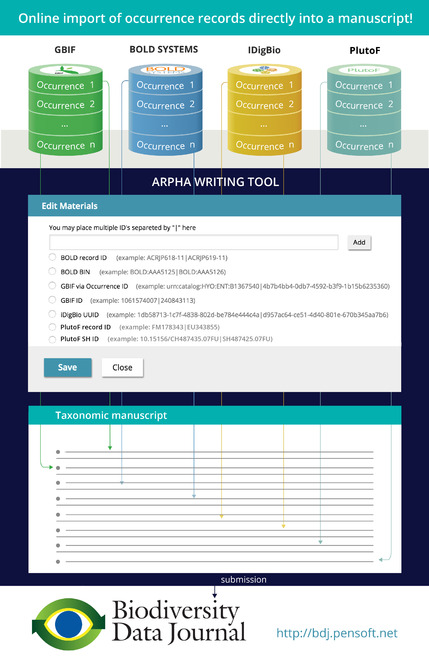 Automated creation of data paper manuscripts from Ecological Metadata Language (EML) metadata in the ARPHA Writing Tool. Primary biodiversity data as defined by GBIF are "Digital text or multimedia data records detailing facts about the instance of occurrence of an organism, i.e. on the what, where, when, how and by whom of the occurrence and the recording". Currently, the majority of primary biodiversity data consists of species-by-occurrence data records available from published sources and/or natural history collections. Other types of primary biodiversity data that merit publication are observational data and multimedia resources in biodiversity. The GBIF Integrated Publishing Toolkit (IPT) facilitates authoring of metadata based on the GBIF Metadata Profile (GMP) that was developed to standardise how biodiversity data resources are described for discovery through the GBIF network. For further information, see the GBIF Metadata Profile, Reference Guide and GBIF Metadata Profile, How-to guide. The GMP conforms to the Ecological Metadata Language (EML) specification with some additional terms drawn from the Natural Collections Descriptions (NCD) set of terms for describing natural history collections and the ISO 19139: North American Profile of ISO 19115:2033 — Geographic Information — Metadata. The GMP elements, together with their descriptions, are listed below. The structure of a Data Paper largely resembles that of a standard research paper. However, it must contain several specific elements. These elements are listed in Table 2 below (see also Chavan and Penev 2011 ), which describes the general structure of the Data Paper (left column) mapped to the metadata elements (right column), and is intended to serve as a human readable model for any Data Paper manuscript, whether generated through the IPT or written independently via a word processor. Sample Data Papers that can be used as an illustration of the concept can be found here (ZooKeys) or here (Biodiversity Data Journal). Structure of a data paper and its mapping from GBIF IPT Metadata Profile elements. Derived from the ‘creator’, ‘metadataProvider’ and ‘AssociatedParty’ elements. From these elements, combinations of ‘first name’ and ‘last name’ are derived, separated by commas(,). Corresponding affiliations of the authors are denoted with numbers (1, 2, 3,...) superscripted at the end of each last name. If two or more authors share the same affiliation, it will be denoted by use of the same superscript number. Format: centred. Derived from the ‘creator’, ‘metadataProvider’ and ‘AssociatedParty’ elements. From these elements, combinations of ‘Organisation Name’, ‘Address’, ‘Postal Code’, ‘City’, ‘Country’ constitute the affiliation. Derived from the ‘creator’ and ‘metadataProvider’ elements. From these elements, ‘first name’, ‘last name’ and ‘email’ are derived. Email addresses are written in parentheses (). In a case of more than one corresponding author, these are separated by commas. If both creator and metadataProvider is the same, the creator is denoted as the corresponding author. Format: indented from both sides. These will be inserted manually by the Publisher of the data paper, to indicate the dates of original manuscript submission, revised manuscript submission, acceptance of manuscript and publication of the manuscript as a data paper in the journal. This will be inserted manually by the Publisher of the data paper. It will be a combination of Authors, Year of data paper publication (in parentheses), Title, Journal Name, Volume, Issue number (in parentheses), and DOI of the data paper, in both native and resolvable HTTP format. Derived from the ‘abstract’ element. Format: indented from both sides. Derived from ‘keyword’ element. Keywords are separated by commas (,). Derived from the Taxonomic Coverage elements. These elements are ‘general taxonomic coverage description’, ‘taxonomicRankName’, ‘taxonomicRankValue’ and ‘commonName’. ‘TaxanomicRankName’ and ‘taxonomicRankValues’. Derived from the Temporal Coverage elements namely, ‘beginDate’ and ‘endDate’. Derived from project elements as described in the GBIF Metadata Profile. These elements are ‘title’ of the project, ‘personnel’ involved in the project, ‘funding sources’, ‘StudyAreaDescription/descriptor’, and ‘designDescription’. Derived from project NCD elements as described in the GBIF Metadata profile. These elements are ‘parentCollectionIdentifier’, ‘collectionName’, ‘collectionIdentifier’, formationPeriod’, ‘livingTimePeriod’, ‘specimenPreservationMethod’, and ‘curatorialUnit’. Derivedfrom methods elements as described in the GBIF Metadata Profile. These elements are ‘methodStep/description’, ‘Sampling/StudyExtent/ description’, ‘sampling/samplingDescription’, and ‘qualityControl/ description’. Derived from physical and other elements as described in the GBIF Metadata Profile. These elements are ‘objectName’, ‘characterEncoding ’,‘formatName’, ‘formatVersion’, ‘distribution/online/URL’ ,‘pubDate’, ‘language’, and ‘intellectualRights’. This element assumes a reference to a research article or a web link, cited in the metadata description. The GBIF Integrated Publishing Toolkit (IPT) makes it easy to share different types of biodiversity-related information: primary taxon occurrence data (also known as primary biodiversity data), taxon checklists, sample-based data, and general metadata about data sources. An IPT instance, as well as the data and metadata registered through the IPT, is connected to the GBIF Registry, indexed for access via the GBIF network and portal, and made accessible for public use. The IPT is a server-side software tool that allows users to author metadata, map databases or upload text files that conform to the Darwin Core standard, to install extensions and vocabularies to allow for richer content and, ultimately, to register datasets for publication and sharing through GBIF. IPT operators undertake the responsibility of running an Internet server which should be maintained, namely, that it should remain online and be addressable. Any set of metadata can be downloaded from any IPT (version 2.0.2+) into RTF format in the form of a data paper manuscript ( Fig. 5 ), and can then be submitted for publication through the normal journal submission and peer review process. Install and run an IPT instance, registering it with GBIF. Use an account on the Pensoft IPT Data Hosting Centre at http://ipt.pensoft.net; if you do not have an account yet, please ask the journal's Editorial Office to open one for you. Approach any other existing IPT operator and seek to host data through them. GBIF provides a list of existing IPT installations supporting the authoring of data papers and a user manual for the IPT. The metadata within one IPT generated archive must describe only one core set of biodiversity data (e.g., either occurrence data, a taxon checklist, or sample data), that is uploaded through the IPT, indexed in the GBIF Data Portal, and published in Darwin Core Archive Format. The IPT will generate an RTF manuscript that will describe the core dataset. The link to the core dataset will appear in your manuscript under the heading “Data published through GBIF”. Additional datasets that relate to the core one, e.g., ecological or environmental data, can also be briefly described within the same resource and linked through the "External links" field of the IPT. Those datasets will appear in the section “External datasets” of your manuscript. It is possible to open a resource and enter the respective metadata for it without upload of a core dataset. This option should be used to describe a dataset that has been already uploaded to a repository (e.g., data previously indexed through GBIF for which you have a GBIF link). In this case, you will need to insert the link(s) to the dataset(s) into the "External links" field of the IPT. The option explained in point 3 above can also be used to describe non-digital natural history collections. We strongly recommend uploading a core set of biodiversity data through the IPT Darwin Core Archive format, which facilitates not only publication of your data but also its easy sharing and integration with other data, hence its re-use and dissemination. The Data Creator completes the metadata for a biodiversity resource dataset using the metadata editor in IPT 2.0.2+. IPT assigns the Persistent Identifier to the authored metadata. Once the metadata are complete to the best of the author's ability, a data paper manuscript may be generated automatically from these metadata using the automated tool available within IPT 2.0.2+ (for RTF download from the dataset webpage, see Fig. 5 ). The author checks the created manuscript, completing the textual Introduction or other appropriate sections, and then submits it for publication in the data paper section of an appropriate Pensoft journal through the online submission system (except for the Biodiversity Data Journal, One Ecosystem or RIO Journal, as these accept manuscripts in a different format). The manuscript undergoes peer review according to the journal's policies and the Guidelines for Reviewers of data paper (below). After review, and in case of acceptance, the manuscript is returned to the author by the editor along with the reviewers' and editorial comments for any required pre-publication modifications. The corresponding author inserts all accepted corrections or additions recommended by the reviewers and the editor in the metadata (not the manuscript of the paper), thereby improving the metadata for the data resource itself. Once the metadata have been improved, the final revised version of the data paper manuscript can then be created using the same automated metadata-to-manuscript conversion tool within IPT 2.0.2+ h was used to create the initally submitted draft (RTF download, see Fig. 5 ). After manual re-insertion of the text of the Introduction, the revised data paper manuscript can then be submitted to the journal for final review and subsequent acceptance decision. Once the manuscript is accepted, it goes to a proofing stage, at which point submission, revision, acceptance and publication dates are added by the publisher, and a Digital Object Indentifier (DOI) is assigned to the data paper. This facilitates persistent accessibility of the online scholarly publication. Once the final proofs are approved by the author, the data paper is published in four different formats: (a) semantically enhanced HTML to provide interactive readings and links to external resources, (b) PDF, (c) final published XML to be archived in PubMedCentral and other archives to facilitate machine readability and future data mining, and eventually also (d) print format identical to the PDF version. After publication, the DOI of the data paper is linked with the Persistent Identifier of the metadata document registered in the GBIF Registry, which is given in the data paper. This provides multiple cross-linking between the data resource, its corresponding metadata and the corresponding data paper. Depending on the journal's policies and scope, the published data paper will be actively disseminated through the world's leading indexers and archives, including Web of Knowledge (ISI), PubMedCentral, Scopus, Zoological Record, Google Scholar, CAB Abstracts, Directory of Open Access Journal(DOAJ), EBSCOHost, and others. 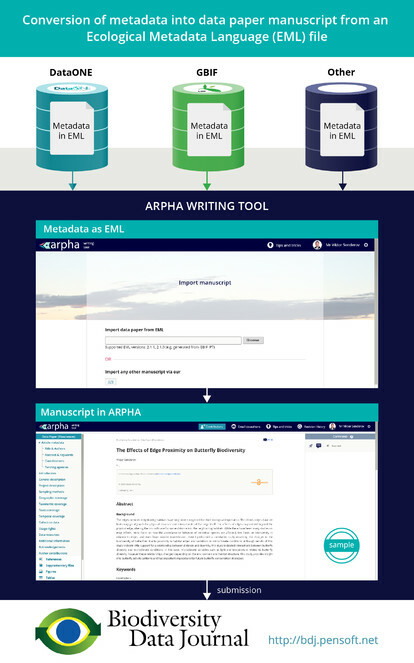 The users of ARPHA need to save a dataset's metadata as an EML file (versions 2.1.1 and 2.1.0, support for other versions is being continually updated) from the website of the respective data provider (see Fig. 5 as an example using the GBIF's Integrated Publishing Toolkit (GBIF IPT)). Some leading data portals that provide such EML files are GBIF (EML download possible both from IPT and from the portal see Fig. 5 ), DataONE, and the LTER Network. Click on the "Start a manuscript" button in AWT and then select "Biodiversity Data Journal" and the "Data paper (Biosciences)" template ( Fig. 7 ). 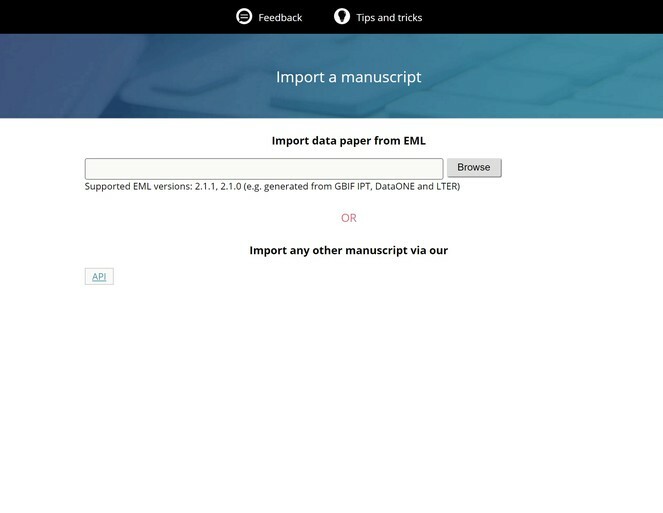 Upload this file via the "Import a manuscript" function on the AWT interface ( Fig. 8 ). Continue with updating and editing and finally submit your manuscript inside AWT. Selection of the journal and "Data Paper (Biosciences)" template in the ARPHA Writing Tool. Import of a data paper manuscript from EML file in the ARPHA Writing Tool. Metadata descriptions of primary biodiversity data used in the GBIF Metadata Proifile (GMP) and the Integrated Publishing Toolkit (IPT) are based primarily on the Ecological Metadata Language (EML) Specification. Therefore, the same basic elements and the overall data paper structure explained in the previous section can also be used to describe ecological and environmental data. As a result, data papers for ecological and environmental data will have a basic structure similar to that of papers on primary biodiversity data. Authors are encouraged to include additional elements (sections) in the manuscripts if they expect this to improve the description of the specifics of their environmental and ecological data. The main difference is that ecological and environmental data cannot be processed through the GBIF IPT and hence they should be deposited in another public data hosting centre listed in the section Open Data Repositories, for example DataONE, LTER Network, PANGAEA or Dryad. Deposit your data in an ISO-certified public (international or institutional) repository. Write a data paper manuscript following the structure of the sample data paper, adding additional elements/sections to the manuscript if these are necessary to describe the specifics of your dataset(s). Add the permanent link(s) in the manuscript to the particular dataset(s) hosted in the repository you have chosen. Submit the data paper to an appropriate Pensoft journal. Once the paper is accepted and published, enter the bibliographic reference and the DOI of the data paper in the relevant metadata field of your data package in the repository that hosts your data. Alternatively, EML metadata files (versions 2.2.0 and 2.2.1) hosted in DataONE and LTER can automatically be converted into а data paper manuscript using the ARPHA Writing Tool import workflow described in the previous section (see also Senderov et al. 2016 and Fig. 6 ). Pensoft journals require, as a condition for publication, that genome data supporting the results in the paper should be archived in an appropriate public archive, and accession numbers must be included in the final version of the paper. Sufficient additional metadata (such as sample locations, individual identities, etc.) should also be provided to allow easy repetition of analyses presented in the paper. For best practice in following community metadata standards, see the many data-type specific standards and checklists provided by the Genomic Standards Consortium (particularly the MIxS standards, as described by Yilmaz et al. 2011 ) and others listed in the standards section of Biosharing. It is quite possible that a single investigation may result in data in more than one archive. DNA sequence data should be archived in GenBank or another public database of the INSDC consortium. Expression data should be submitted to the Gene Expression Omnibus or an equivalent database, whereas phylogenetic trees should be submitted to TreeBASE. More idiosyncratic data, such as microsatellite allele frequency data, can be archived in a more flexible digital data repository such as Dryad or Knowledge Network for Biocomplexity (KNB). Barcode-of-Life COI (mitochondrial encoded cytochrome oxidase 1) genome data can be published in a form of a Data Paper, as has been announced by the Consortium for the Barcode of Life (CBOL) and illustrated by some published sample papers ( Foottit et al. 2014, Rougerie et al. 2015, Raupach et al. 2016, Pohjoismäki et al. 2016 ). CBOL urges participants in major DNA barcoding initiatives to consider submitting “BARCODE Data Release Papers” for publication in academic journals. The instructions below are incorporated from the Guidelines to Authors of BARCODE Data Release Papers with the kind permision of CBOL and adjusted for the specifics of Pensoft journals. Definition: A BARCODE Data Release Paper is a short manuscript that announces and documents the public release to a member of the International Nucleotide Sequence Data Collaboration (INSDC, which includes GenBank, ENA,and DDBJ) of a significant body of data records that meet the BARCODE data standards. Contents: BARCODE Data Release Papers are meant to announce and document the public availability of a significant body of new DNA barcodes. The barcode records should therefore be a coherent set of records that provides noteworthy new research capabilities for a taxonomic group, ecological assemblage or specified geographic region. Authors should explain the rationale for creating a comprehensive library of BARCODE data for that taxonomic group, ecological habitat, and/or geographic region. If the data have been collected as part of a larger, longer-term research project, the manuscript should explain the wider project and its planned use of the data for taxonomic, biogeographic, evolutionary, and/or applied research, or for other purposes. The processes used to identify the species to which voucher specimens belong. * Calculated as the arithmetic average of all K2P distances between specimens in each species. ** Closest species pairs refers to each species and the species with which it has the least divergent barcode sequence. The true phylogenetic sister-species may not be included in the dataset, and could have a lower interspecies divergence. The Barcode of Life Data Systems (BOLD) record number (optional). Data quality: All data records should meet the BARCODE data standards agreed to by CBOL and INSDC. The manuscript should demonstrate the effectiveness of the BARCODE records in distinguishing species, as well as pointing out limitations of the BARCODE data for species identification. Significance of the data records: The data records being released should represent a significant addition to the public knowledge base. The manuscript should demonstrate the significance of the new records relative to the previously released BARCODE data for that combination of taxonomic group, ecological habitat, and geographic region. Manuscripts that announce the release of the first BARCODE records representing a higher proportion of species in a taxonomic group will have higher significance. Relevance to other research programs and societal applications: BARCODE data release manuscripts will be considered more relevant if they treat taxonomic groups, ecological habitats, and geographic regions that are connected with other basic research programs in evolutionary biology or ecology, or are components of applied research for socioeconomic reasons (e.g., agriculture, food safety, conservation, environmental monitoring, public health). Documentation and accessibility: The voucher specimens and their associated data and metadata will be valuable resources for the research community. The data table in the Appendix must provide links to the voucher specimens and taxonomic identification, as well as the INSDC Accession Numbers. Reviewers will evaluate the degree to which voucher specimens are available in permanent repositories (as opposed to private research collections) and degree to which taxonomic identifications are documented in published or other resources. Provisional non-Linnean taxonomic labels may be used, but they should be linked to online databases that document the author's concept of the taxonomic unit. An increasing number of software tools also merit description in scholarly publications. The structure of the data paper proposed below for such software tools is largely based on the Description of a Project (DOAP) RDF schema and XML vocabulary developed by Edd Dumbill to describe software projects, in particular those that are open-source. The main difference, however, is that the data paper aims at the description of the software product and not of the software source code; data papers of this kind are addressed mainly to end users of the software and less to developers and software engeneers. Importance: Software should be considered a legitimate and citable product of research. Credit and Attribution: Software citations should facilitate giving scholarly credit and normative and legal attribution to all contributors to the software. Unique Identification: A software citation should include a method for identification that is machine actionable, globally unique, interoperable, and recognizable. Persistence: Unique identifiers and metadata describing the software and its disposition should persist. Accessibility: Software citations should facilitate access to the software itself and to its associated metadata, documentation, data, and other materials. Specificity: Software citations should facilitate identification of, and access to, the specific version of software that was used. Based on an analysis of several use cases such as publishing a software paper or publishing papers that cite software, basic metadata requirements were identified: unique identifier, software name, author(s), contributor role, version number, release date, location/repository, indexed citations, software license, description, keywords. While the provision of detailed specifications and recommendations around metadata standards were beyond the scope of the working group, DOAP is mentioned together with some other more recent community initiatives. It is expected that a new working group will take these software citation principles forward by supporting potential implementers and developing metadata standards, following the example of the FORCE11 Data Citation Working Group ( Cousijn et al. 2017 ). According to DOAP, major properties of a software tool description include elements such as homepage, developer, programming language and operational system. Other properties include: Implements specification, anonymous root, platform, browse, mailing list, category, description, helper, tester, short description, audience, screenshots, translator, module, documenter, wiki, repository, name, repositorylocation, language, service endpoint, created, download mirror, vendor, old homepage, revision, download page, license, bug database, maintainer, blog, file-release, and release. A basic version of a DOAP description can be generated using an online tool called doapamatic. A sample structure of a Software Description paper was introduced and used by Pensoft since 2011 ( Penev et al. 2011 ) and is listed in Table 4 below. Please note that this structure is provided in order to recommend a more or less unified character of this kind of Software Decsription papers. The sections and sub-sections listed in the left column are mandatory for the paper, while their content, listed in the right column in a form of elements or recommendations, needs to be defined by the authors to describe the software tool in the best possible way. Derived from the ‘name’ element. This must be extended to a concise description of the software tool and its implementation, e.g. : “BioDiv, a web-based tool for calculation of biodiversity indexes”. Format: This is a centred sentence without full stop (.) at the end. Derived from the ‘developer’, ‘maintainer’ and eventually ‘helper’, ‘tester’, and ‘documenter’. From these elements, combinations of ‘first name’ and ‘last name’ are derived, separated by commas (,). Corresponding affiliations of the authors are denoted with numbers (1, 2, 3,...) in superscript at the end of each last name. If two or more authors share same affiliation, it will be denoted by use of the same superscript number. Format: centred. ‘City’, and ‘Country’ will constitute the affiliation. ‘documenter’ elements. From these elements ‘first name’, ‘last name’ and ‘email’ are derived. Email addresses are written in parentheses (). In case of more than one corresponding author, these are separated by commas. Format: indented from both sides. These will be inserted manually by the Publisher of the data paper to indicate the dates of original manuscript submission, revised manuscript submission, acceptance of manuscript and publishing of the manuscript as data paper in the journal. This will be inserted manually by the Publisher of the data paper. It will be a combination of Authors, Year of data paper publication (in parentheses), Title, Journal Name, Volume, Issue number (in parentheses), and DOI of the data paper in both native and resolvable HTTP format. Derived from the ‘short description’ element. Format: indented from both sides. Keywords should reflect most important features of the tool and areas of implementation, and should be separated by commas (,). Derived from ‘description’ element; if applicable, it should also include sub-elements such as ‘title’ of the project, ‘personnel’ involved in the project, ‘funding’ sources’, and other appropriate information. Derived from ‘Implements specification’ and ‘audience’ elements; please remember that this section is of primary interest to end users, and should be written in detail, if possible including use cases, citations and links. Any kind of helpful additional information may be included. Lists all acknowledgments at the authors' discretion. Includes literature references and web links cited in the text. Data papers describing data resources — or manuscripts linked to open data resources that underpin the scientific analyses — that are submitted to Pensoft journals will be subjected to peer review according to the respective journal's policies (e.g., conventional pre-publication anonymous, non-anonymous, or entirely open and public, including post-publication review) as a routine method to enhance the completeness, truthfulness and accuracy of the descriptions of the relevant data resources, thereby improving their use and uptake. 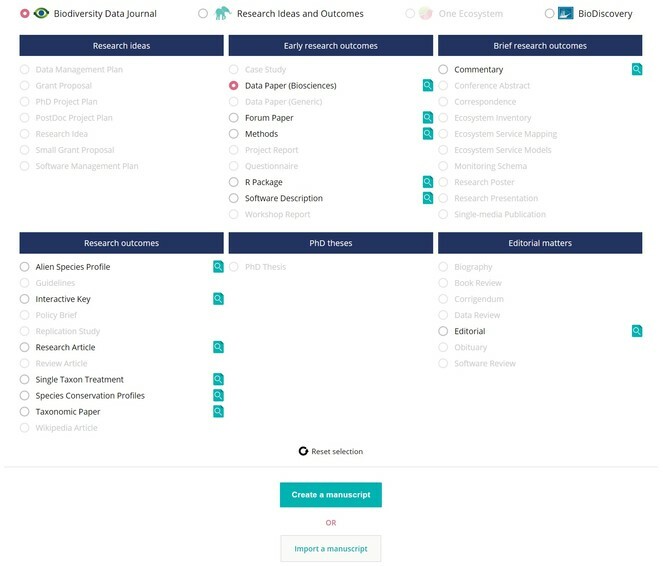 A specific feature of the ARPHA-XML journal publishing workflow used by the Biodiversity Data Journal, Research Ideas and Outcomes (RIO Journal), One Ecosystem, and others, is the so called pre-submission peer-review which can be organized by the authors or the journal's editorial office still during the authoring process in the ARPHA Writing Tool. Peer review of data papers is expected to evaluate the completeness and quality of the dataset(s) description (metadata), as well as the publication value of data. This may include the appropriateness and validity of the methods used, compliance with applicable standards during collection, management and curation of data, and compliance with appropriate metadata standards in the description of the data resources. In order to allow for accuracy and usefulness, metadata needs to be as complete and descriptive as possible. Reviewers will consider the following aspects of (a) the quality of the manuscript, (b) the quality of the data, and (c) the consistency between the description within the data paper and the repository-held metadata relating the data resource itself. Authors are not sufficiently trained in and accustomed to the good practices of formatting and describing their data. Reviewers do not pay sufficient attention to data reviews. A proper review of large datasets may appear merely impossible due to the volume of work. Editors are not sufficiently experienced in data review, which often requires specific training in data management. Data are of different types and specificities, which imposes additional problems to find suitable reviewers or editors. Data standards to consider as a "rule-to-follow" are at different levels of development and adoption by different communities. Several Pensoft journals offer an additional service for auditing and correcting data, which might be a solution for those authors or their institutions who really care about data quality and re-use. Best practice recommendations for evaluating data papers or manuscripts that are submitted together with the underlying data are summarised below. Does the manuscript conform to the focus and scope of this journal? Does the manuscript contain unpublishable — for example fraudulent or pseudoscientific — content? Does the manuscript contain sufficiently detailed information to merit publication? Do the title, abstract and keywords accurately reflect the contents of the manuscript? Is the manuscript internally consistent and suitably organized? Is the manuscript written in grammatically and stylistically correct English? Are the methods relevant to the study and adequately described? Did the authors cite most of the literature pertinent to the subject? Are relevant non-textual media (e.g. tables, figures, audio, video) used to an appropriate extent and in a suitable manner? Are the illustrations of sufficient quality? Are the data freely and openly available under an appropriate Creative Commons license or waiver? Does the data resource cover scientifically important and sufficiently large region(s), time period(s) and/or group(s) of taxa to be worthy of a separate publication? Are the methods used to process and analyse the raw data, thereby creating processed data or analytical results, sufficiently well documented that they could be repeated by third parties? Are the data plausible, given the protocols? Authors are encouraged to report any tests undertaken to address this point. Is the dataset sufficiently unique to merit publication as a data paper? Are the use cases described in the data paper consistent with the data presented? Would other possible use cases merit comment in the paper? We thank several colleagues who commented or contributed to an earlier version of the draft: Tim Robertson and Kyle Braak (GBIF), Todd Vision and Peggy Schaeffer (Dryad). We also thank all our authors, reviewers, editors and partners for their support in testing and using these data publishing guidelines and workflows. Special thanks are due to Donat Agosty, Terry Catapano, Guido Sautter and Willi Egloff from Plazi (Switzerland) for the years-long successful collaboration, and friendship, and to Robert Mesibov (Tasmania) and Florian Wetzel (Museum für Naturkunde, Berlin) who provided open pre-submission peer reviews to the manuscript. The present guidelines were elaborated through the FP7 funded project EU BON: Building the European Biodiversity Observation Network, grant agreement ENV30845, and constitute Milestone MS842. V. Senderov's PhD is financed through the EU Marie-Sklodovska-Curie Program BIG4 project, Grant Agreement Nr. 642241. How to Cite Datasets and Link to Publications. DCC How-to Guides. Edinburgh: Digital Curation Centre.
. https://www.cbd.int/sp/targets/. Accessed on: 2017-2-22. Geographic distibution of the rock-dwelling door-snail genus Montenegrina Boettger, 1877 (Mollusca, Gastropoda, Clausiliidae).
. https://www.rd-alliance.org/about-rda. Accessed on: 2017-9-02. Project description: DNA barcodes of bird species in the national museum of natural history, smithsonian institution, USA.